SOTA LP Record Cleaning Machine Has Arrived! It's been almost a year since I met Kirk and Donna Bodinet of SOTA. We shared a room with SOTA at the 2013 AXPONA Show in Chicago, and I was duly impressed with their flagship Millenia turntable as well as the entry-level Moonbeam and Comet. We talked about their record cleaning machine, known by most as the RCM; after almost 30 years with Nitty Gritty record cleaning machines I was ready for a change, but I couldn't afford the monster machines from the likes of Loricraft or even Keith Monks. The RCM is $950. There's an option for an exhaust fan, which my unit has, and that brings the price to an even $1000. That's more than the entry level units from VPI and Nitty Gritty, but far less than those aforementioned super machines. In fact, the RCM is priced about halfway between a VPI 16.5 and a VPI 17, and the features contained in the RCM are also somewhere halfway between the two machines from New Jersey. So you get the smooth, automatic operation and convenience of more expensive machines, but not the silence. Fortunately the cleaning process works so flawlessly with the SOTA that it's easier to step away from the noise while the LP is being cleaned. So far I'm really enjoying the SOTA LP RCM. It's a much more substantial unit than my old Nitty Gritty machines, and it's far easier to use. My only issue so far is that I have to get into the habit of using less fluid during cleaning, otherwise it takes a while for the vacuum wand to completely dry the record. I'll get the hang of it. I'll give the RCM a complete, thorough review in the next few weeks. 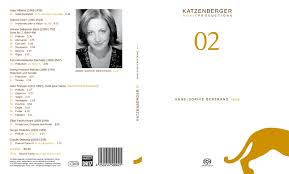 I'm referring to the fact that I reviewed Katzenberger Music Productions' 01 with certain audiophiles in mind--the ones who need the female voice to evaluate audio gear. 02, however, is a stupendous reproduction of solo harp, and for years I've been using the harp as one of my many tools to gauge the sound of an audio system. The problem I've had, up until now, is that I don't really own that killer harp recording that clearly measures the space a harp occupies and how, like a piano, the notes come from precise locations along the instrument as the musician moves up and down the scales. (In some cases, depending on how the microphones are placed, those notes may move back and forth instead of side to side.) The closest thing I have to a decent harp recording demo is Joanna Newsom's The Milk-Eyed Mender or even the epic Ys, and I've learned that while her harp playing is utterly transcendent, her voice polarizes listeners to the point of distraction. Personally, I love Ms. Newsom's Lisa Simpson-esque voice, but there are songs in her catalog that may clear a room. Anne-Sophie Bertrand, for what it's worth, does not sing along while she plays the harp. She's not a pop singer, for one, and these musical selections from Albeniz, Faure, Bach, Mendelssohn, Handel, Debussy and Prokofiev wouldn't be favorably enhanced by such modern embellishments. In addition, 02 sounds distant and remote in terms of soundstage and imaging, just like 01 did--and like Joanna Newsom doesn't. 01, however, succeeded at capturing the illusion of two performers creating music in a relatively large space. 02 was recorded in another large space, the Festeburg Church in Frankfurt-Preungeshime, which is renown for its excellent acoustics. You won't hear the same vast room boundaries, but you will hear the same distant perspective--a seat several rows back, more specifically--coupled to a clean, pristine and intimate point in three-dimensional space. None of this spaciousness and perspective matters if the content isn't extraordinary, which it is. I knew I was in for a different type of harp recording after just a few seconds of the opening piece, Isaac Albeniz' Suite Espagnole. I've heard this piece many times before, but never on a harp. Miss Bertrand infuses a liquid, wavelike momentum into the piece that may remind you of the opening movement of La Mer. The music rises, falls, swells and bursts, and the usually demure timbre of the harp does not quell the excitement one iota. I've heard so many harp recordings focus on quaint beauty rather than real emotions, but Suite Espagnole possesses so much sheer drama that your heartbeat might increase before the end of the piece. 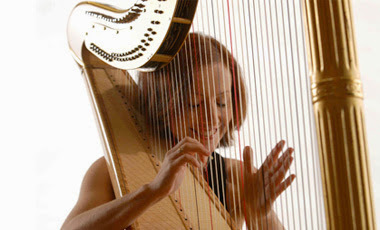 Good harp recordings may induce goosebumps, but how many of them will get your motor running? This one will. The rest of the album is equally exquisite--particularly a world premiere recording of Jean Francaix's Suite pour Harpe that makes you wonder why anyone waited to present this to the world. 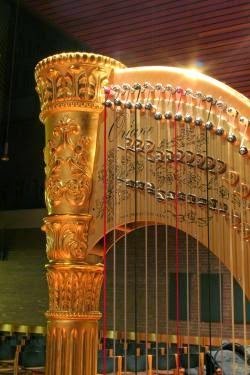 The rest of the programme spans three centuries and seeks to illustrate the harp's history--the adoption of polyphonic patterns, for example, as well as the continued popularity of the instrument well into the 20th century. In 02 you have that rarity, a stunning performance of striking material that sounds incredibly real. For now, it's my reference harp recording, the one I want to play when I need to hear what a harp would sound like in my listening room. Highly recommended.